Decent for the price and availability when everything in Moab was either full or super expensive. No elevator. The pool and hot tub were functioning but appeared to be on the cloudy side - there were kids swimming but I would not have. The room was clean and well kept. Beds and pillows were not the most comfortable but again, not bad for the price. Staff was very nice and breakfast wasn’t bad - cereal, juice, coffee, fresh waffles, hard boiled eggs, various baked goods, toaster and toast/bagel condiments. Not a bad option if you’re looking for something cheap and last minute. About a 50 min drive to Arches and Moab. Fine hotel. Friendly staff. Perfect except the refrigerator froze my food. Very clean and comfortable rooms. The hotel staff was very friendly and helpful. Breakfast was good. We would definitely stay there again. The sink in my brothers room collapsed. The pool/hot tub had WAY too much chlorine. The beds were hard. The staff was NOT friendly. The breakfast was pretty good. Good location next to the exit coming from Moab. "ok" hotel for a smaller town. Definitely get what you pay for. Facilities are dated but suitable for a one night, just passing through, stay. Staff was friendly. When I attempted to check into the motel the clerk said he did not have a reservation for me although I had made it two weeks earlier. He did not ask me if I still wanted to check in so I left a drove down to the Comfort Inn and checked in. Booked a room right after calling and making sure they still had rooms. We were told they still had a few available. When we arrived they informed us they were sold out and our room wasn't available. Said they must of booked the room after we hung up the phone and booked it online (since it was cheaper). How is it we were able to book a room, drive all the way there (over a hour and a half) and not have a room available? We ended up having to drive another hour North to Price, UTAH to get another room. The lady at the front desk was very unhelpful and when my gf called to make sure there was rooms available the person on the phone was extremely rude but unfortunately it was our only option for the area. Every place was already sold out. If I was you find another place to stay!!! Very clean, nice rooms. Up to date, but no usb ports in room. Nice pool and hot tub! The young man at the front desk was WONDERFUL!!! He recommended a great restaurant, put us in a quiet room and suggested where to park our motorcycle. Rude. Very agressive réception. Did not want to honor my reservation. Had to wait 15 minutes before a staff member camemail to check me in. He had been out back smoking, I could smell it on him. The spa and pool (which are indoors) were closed for winter. There was no breakfast and I was promised a discount/refund, but have yet to get it. And there was no one there when I checked out. The staff was excellent. My wife was not feeling well, and they prepared a room well in advance of check in. All week the manager, Raj, took it upon himself to make sure that we had everything we needed. Best service we've ever had at a hotel. Toilet didn't flush and was never corrected; shower did not drain much at all. People should be warned about Room 111. Rooms were clean and in good condition. TV worked with remote and CC and coffee was good. Didn't use the MW or refrigerator so no comments there (but they worked). The only reason I give it 4 stars for comfort is the lack of plugs for technology products (laptop, phones, etc). There were NO free plugs in the room at all--all were used by appliances like the MW, coffee maker, TV, etc so future users bring some three-port outlet extenders! Great! Room was clean, roomy and comfortable. Staff was courteous and helpful. Co-manager Raj is super helpful. Green River is close (under 1-hour drive) to Arches, Canyonlands, Goblin Valley and San Rafael Swell. Hotel has comfortable indoor pool and hot tub. Eating options are few but delicious. Ray's Tavern burgers are great and stop by the taco truck! The Americas Best Value Inn Green River is part of a chain of inexpensive motels. As the Moab - Green River area is very expensive, this is one of the cheapest places to stay. The motel has been renovated recently. The hallways are reasonably clean, The room is very clean (at least, mine was.) Important amenities are the refrigerator (with freezer) and microwave oven in the rooms. My stay here was pleasant but, for the same price, I would rather stay at the Super 8 Motel in Moab. This time, I could not find a room there, so this is was a reasonable alternative. The Motel is also a good choice if you are traveling on I70 and need an inexpensive place to spend the night. 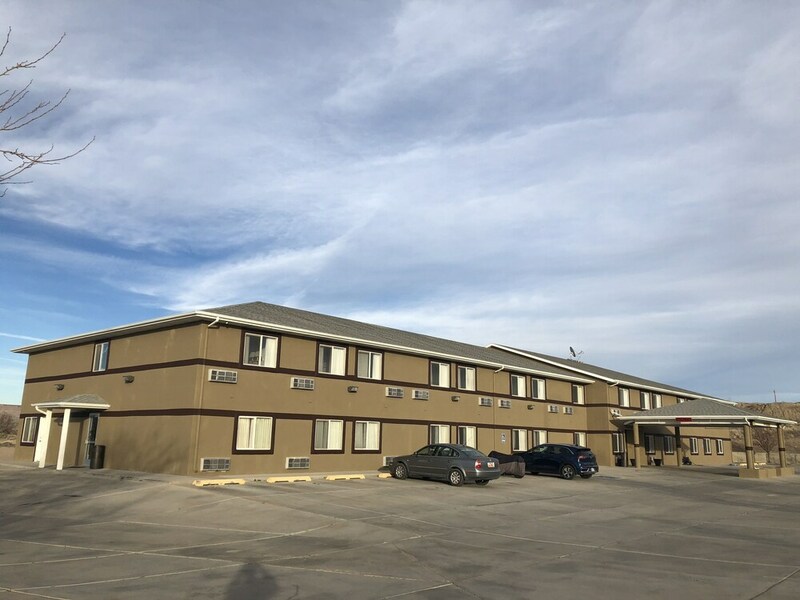 Located within a 5-minute walk of John Wesley Powell River History Museum, Americas Best Value Inn Green River is within a mile (2 km) of Green River State Park Golf Course. This 44-room hotel has free breakfast along with conveniences like an indoor pool and free in-room WiFi. Free continental breakfast is included with your stay and awaits you each morning. Guests can expect to find free WiFi and 32-inch a TV with cable channels. The bathroom offers hair dryers and free toiletries. Other standard amenities include a refrigerator, a microwave, and a coffee maker. Americas Best Value Inn Green River offers an indoor pool, a spa tub, and free WiFi in public areas. Free parking is available if you drive. The 24-hour front desk has staff standing by to help with luggage storage, and answer any questions about the accommodations. Additional amenities include a 24-hour business center and coffee/tea in a common area. The preferred airport is Moab, UT (CNY-Canyonlands Field): 30-min drive, 32.6 mi/52.4 km.